Thunderkick likes to do things a little differently with their video slots, especially when it comes to theme – Yeti: Battle of Greenhat Peak is a case in point. It’s a 5 reel, 11 game that stars the famous mythical creature and a strange little man in lederhosen! Highlights include sticky wild respins and a bonus round that awards up to 31 free spins. Play, on all devices, from between 10p and £100 per spin. Like all the other games in the Thunderkick catalogue, the design in Yeti: Battle of Greenhat Peak is impressively done. Set against a wintry backdrop, you’ll see A to J playing cards, cherries, lemons, melons and the yeti which is the top payer, awarding 35 times your bet if you land 5 on a payline. Wild Attack feature – this is triggered by landing 2 of the giant carrot bonus symbol on the same spin. You’ll then be awarded a respin with between 1 and 3 sticky wilds added. You can also trigger the Bonus Game feature from here. Bonus Game feature – land 3, 4 or 5 of the giant carrot scatter symbol anywhere on the reels and your reward will be 10, 15 or 20 free spins. Every bonus symbol that lands during the feature is added to the Wild Attack meter. Every third bonus symbol collected adds 2 extra free spins to your total as well as bringing an extra sticky wild into play. If you manage to fill the meter, 5 extra free spins are awarded. Get the maximum and you could get 31 free spins here. Any wilds that hit during this feature lock in place until they form part of a winning combination. Thunderkick has a knack for creating entertainingly bonkers video slots and Yeti: Battle of Greenhat Peak matches that description rather nicely. The theme is as crackers as usual. There are some good features to go with the madcap design though and the respins and free spins both offer some decent potential thanks to the sticky wilds – saying that, the variance is on the lower end with top wins of 845 times your bet available on every spin. With their crazy themes, top notch visuals and quality features, Thunderkick have become one of our favourite developers. 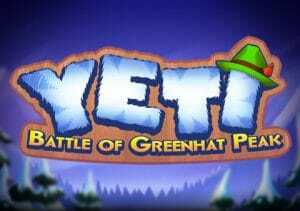 With Yeti: Battle of Greenhat Peak, they’ve hit the bullseye once again. If you want something with bigger potential payouts, you cannot go wrong with Wild Heist at Peacock Manor and/or Flame Busters (both by Thunderkick).